ATTENTION! The western Ukraine, where the tour is planned, is safe and very far away from political tensions, that happened in easternmost parts of the country. Galicia is pro-European, don't be afraid to come here and support the country! The lush green Ukraine I dream of and long for day and night lies far away? goes a popular Polish drinking song. She isn't all that far away though and is only a few hours bus ride from Krakow. After crossing the border you might think you've gone back about 20 years in time. 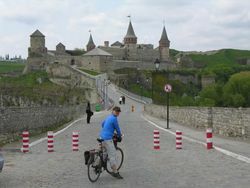 Our Ukraine tour fills a gap in the world of cycling as no other cycle tour operator offers this destination. Now tourists on two wheels can also discover the Ukrainian countryside for themselves. 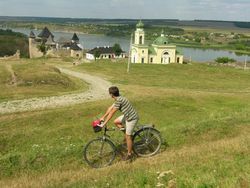 Why cycle through Western Ukraine? Because it is the only country in central Europe that has not yet been discovered by cyclists despite its numerous historical monuments and splendid landscapes. Because there is already a tourist infrastructure in place. Not only the big cities but also smaller areas have decent new or renovated hotels of good standard. Because cycling in Ukraine is simple and relaxed. Even the main roads have little traffic and the side roads and paths are practically free of cars. Because the visa formalities are uncomplicated and EU-citizens, as well as US-Americans and Canadians do not require a visa. So, come on! We have an ideal 10-day program from/to Krakow covering highlights of Western Ukraine such as the Carpathian mountains and the Dniester River Valley as well as places of cultural interest such as Lviv, Chernivtsi and Kamianets-Podilskyi. 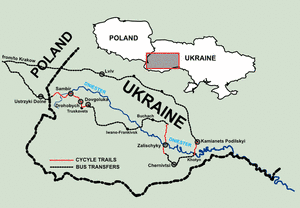 We follow the course of the Dniester from the Carpathians to Podolien. And where distances permit we will be cycling between the historical cities. Apart from the first and last days only one bus transfers will be necessary during the cycling legs of the tour. Individual arrival in Krakow. We meet at the Bird Service office in the old town at noon and leave by bus at 2:00 pm for Ustrzyki Dolne (a small town at the Ukrainian border), where we will also be having dinner. After entering Ukraine we will be stopping at the first village after the border, Terlo, to get on to our bicycles. We follow the creek valleys and cycle through the colourful villages of the Carpathian mountains to arrive at the upper Dniester River Valley in Staryj Sambir. Following the river brings us to Sambir, where we check into the recently renovated hotel at the market square. This ride shows a rapid change of scenery. We ride through a flat plain, where the Dniester River once flowed through large swamps and then along old avenues lined by trees onto Drohobych, once the centre of the salt mining industry. Though the second largest city in Lemberg province, this sleepy and provincial city is small but impressive with numerous historical monuments that can be admired on bicycle. We will be staying in the brand new three-star hotel at the outskirts of the city. Our first destination today is the well developed Truskavets health resort with over a dozen mineral springs. 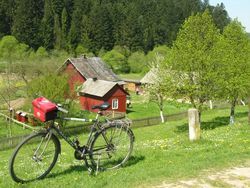 We then cycle through dense oak forests to the remote village of Dovgoluka. We will be staying at Shepilska, a modern tourist center, located "in the middle of nowhere"
We spend the day in Podolia and get to see a particularly spectacular natural formation of this large region, the "Yar". The word literally means "gorge", and is a brook or river canyon cutting deeply into the red sandstone. After following the course of the Dshuryn River for a while, we cycle past the ruins of Cherwonograd, a former Polish fortification, to reach the Dniester River, which flows through a particularly deep "Yar" here. There was a settlement of Saxons in the large Dniester-Loop once known as "Hinterwalden" (Backforests). They had been naturalized by an erstwhile Polish king. The name of the settlement was translated and later on known as "Zalischyky". Up until now we were in the former Kingdom of Galicia. Now we find ourselves in an old border area where the Polish Aristocratic Republic, the Russian Empire and Osmanian Empire once met. The land south of the Dniester, where we will be cycling today, belonged to Romania until 1939. In earlier days it belonged to the historical region of Bukowina, integrated into Austria by Empress Maria Theresa. 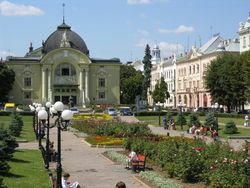 The capital city of Chernivtsi is an attraction without par. Its stone monuments go back to the "Golden Age" of the Austro-Hungarian Dual Monarchy when Chernivtsi (named Czernowitz) was the pulsing capital of the area belonging to the Crown with the eastern-most university of the West. 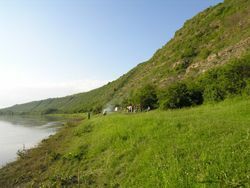 We return to the Dniester Valley via wine villages and fruit plantations. In Khotyn one can see a castle up on the cliffs that watched over the former Polish-Turkish border for centuries, high above the dammed river. Our final destination is Kamianets Podilskyi. It is one of the oldest cities of Ukraine and is remarkably located. Smotrych River meanders through a 60 m deep gorge in the limestone of the Podolian Upland. One of its serpentine curves is around a large mountain on top of which the historic town was constructed with heavy fortification walls. Entry to this strategically favourably situated city was made even more secure by a fortress. 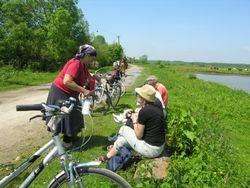 Departure from Krakow or participation in another cycling or trekking tour organized by Bird Service. All rooms have their own shower/WC. We will book the best lodgings available of good 2-3 or even 4 star standard. The buildings are new and modern for the most part. This tour is offered as a full-board tour as the villages do not have public bars or snack bars. This includes: breakfast, a picnic lunch for the road and a warm evening meal. We let our guests organize their own meals only on the last evening in Krakau as our arrival might be delayed depending on the situation at the border. Luggage transportation from hotel to hotel. Not included in the price: Travel to Krakow, drinks and tips.